Thinking of taking your carefully-crafted studio creations to the masses? Here are some pointers to make sure your sound survives the transition to the live arena. A significant number of SOS readers, including myself, play their compositions live, but getting the same kind of sound quality at a venue as you achieve in the studio can be difficult. This article looks at some possible solutions and also highlights a few of the problems that you might come across. The biggest problem for the majority of musicians playing small venues is finding an affordable sound system that can reproduce the full range of today's music — small vocal PAs can't handle the bass end, while the traditional bass bin is simply too large to fit into the average estate car or hatchback. There's also the matter of quick and easy setup to consider, so stereo systems comprising separate high-frequency/mid-range cabs and bass speakers, power amps, crossovers and mixers are less than ideal. 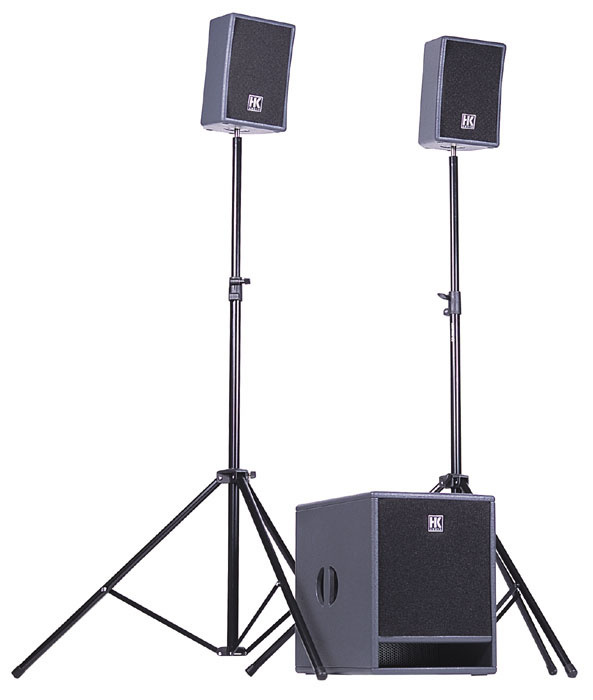 A compact active PA system with two-way satellite speakers and a separate subwoofer, such as the HK Audio LUCAS XT system shown here, is ideal for most small venues.The most practical solution in most cases is to choose one of the new generation of powered PA systems, where the amplifiers and crossovers are built into the loudspeaker cabinets, and, for full-range music, a system that uses two smaller cabinets to handle the mid-range and high end, augmented by a sub-bass speaker, makes the most sense. Because the power amps and crossovers are built into the speakers, all that's needed to complete the system (other than a few cables) is a suitable mixer — and small to medium-sized analogue mixers are very cheap these days. A further advantage of using an active system with a single sub-bass speaker is that, if you decide it's worthwhile to experiment with surround sound, you only need add more mid-range/high-frequency speakers, as the same subwoofer will provide the bass end for the entire system. Keyboard players should note that a small PA of this type also makes an ideal stereo keyboard rig for stage use and is likely to give better results than an all-in-one keyboard combo. Deciding what power of system you need is rather less clear cut, but to produce full-range music in a pub/club/village-hall environment, I think it's fair to say that a system power of 1000 Watts should be considered about the minimum if you like to play reasonably loud, though the efficiency of the loudspeakers in the system has a bearing on this too, making it hard to be too specific. Smaller systems are of course suitable if you're playing chill-out or ambient music at lower levels, but if you like the sound to kick, then buy all the power you can squeeze into your car. 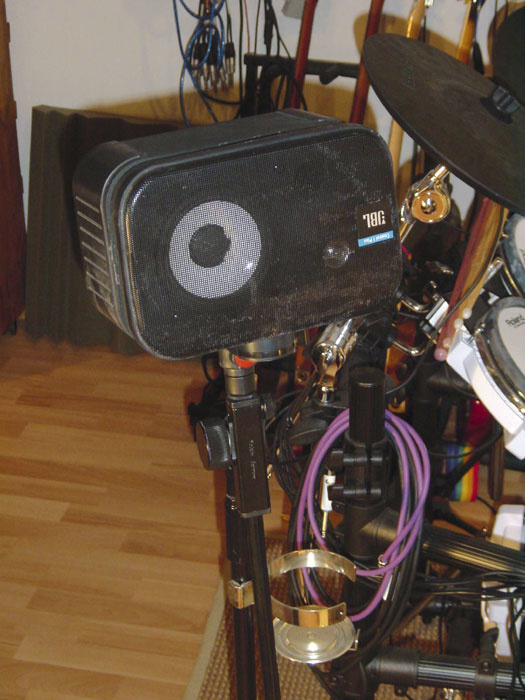 Adequate power handling is particularly important if your set includes live or recorded electronic drum parts, as these carry a huge amount of low-frequency energy. When you consider that an unamplified acoustic bass drum on its own can be as loud as a 200W amplifier, it is clear that having plenty of available low-end power is vital. One often-overlooked fact is that both main and monitor speakers used for live sound need to have properly controlled dispersion characteristics, by which I mean that their angle of coverage should be reasonably consistent across the audio spectrum, other than at very low frequencies where the radiation pattern tends towards being omnidirectional. Unless the speaker system is properly designed, it is easy to end up having a very wide dispersion at low frequencies, but a very narrow dispersion at higher frequencies, and although the high frequencies may project well to the back of the room, anyone hearing the sound from anywhere off axis will perceive the result as being rather dull sounding. Furthermore, the indiscriminate 'beaming' of high frequencies in this way can increase the risk of feedback. Because a single loudspeaker can't handle the full frequency range at the required SPL (Sound Pressure Level) while providing a reasonable dispersion pattern, commercial systems either tend to use multiple small speakers, as in the case of those manufactured by Bose, or more often they use a larger speaker complemented by a high-frequency horn tweeter. A crossover is used to direct the required part of the spectrum to the different drivers, and in a typical active system that uses a subwoofer to provide the bass end, a single good-quality 12-inch speaker (or even smaller) plus a horn tweeter is generally all that the mid-range/high-frequency speakers require. Figure 1. Angling your speakers for reduced feedback and better audience coverage.To get the best result from your speakers you need to have some basic understanding of the way sound behaves in a room. As you've probably already gathered, people tend to absorb sound fairly efficiently, so if you don't get your speakers high enough, a lot of your sound will be soaked up by the first row of the audience! 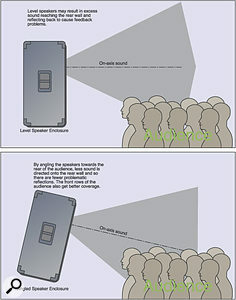 To enable the people at the back to hear you properly, the speakers clearly need to be above the head height of the front rows of the audience. This has the added benefit of reducing the amount of energy aimed directly onto the people at the front, so they won't be deafened in the cause of trying to project your sound to the back of the room. However, be aware that, if the back of the room is a large, flat, hard wall (as is so often the case), there is an advantage in being able to angle the speakers down slightly so that they aim at an area roughly two thirds of the way back into the audience, rather than directly at the back wall where a lot of the sound energy will simply bounce back at you and make the overall sound less clear. Where possible, you should also set up your speakers to minimise reflections from walls or ceilings, as these not only compromise the sound, but also increase the risk of feedback. Any surface that can bounce the sound from your speakers back into your microphones is a potential problem. Ideally, all of the sound would be directed at your audience and none at the walls or ceilings, Clearly this isn't possible in practice, but you should still aim to get as close to this ideal as possible. The walls nearest to the speakers are often the most problematic ones, so, if reflections are inevitable, try to angle the speakers so that the reflections bounce away rather than back onto the stage. Sound behaves much like light, insomuch as the angle of incidence equals the angle of reflection, so rotating the speaker cabs inwards to avoid too much sound being directed onto the side walls may make a useful improvement. The same rules of speaker positioning relative to the performers that apply to basic PA systems also apply to systems with subwoofers, though the positioning of the sub itself is less critical due to the fact that very low frequencies are virtually omnidirectional. In fact you can sometimes get a little more 'free' bass end by positioning the sub near a wall or even a corner (something you'd normally avoid in studio monitoring). If no vocals are involved, put the mid-range/high-frequency speakers behind you so that you can hear what you're playing without recourse to a separate foldback system, but if you need to add live vocals then the speakers should be in front of you in order to keep feedback problems to a minimum. Of course putting the speakers in front of you also means you can no longer hear yourself properly, so you need to add some kind of foldback system. Figure 2. Placing on-stage foldback monitors to minimise feedback problems.If you think it looks cool, you could simply buy a headphone distribution amplifier and all wear cans, but the more traditional approach is to use one or more foldback speakers. These are usually floor wedges (comprising one cone driver plus a horn tweeter and the necessary crossover), as this format provides the necessary coverage without obstructing the view from the audience, and, in the name of simplicity and efficiency, a powered monitor is the easiest to set up. A powered monitor also allows the foldback level to be controlled from the monitor itself, which is useful in situations where you don't have an engineer handling the mix for you. Monitors should always be placed as close as possible to facing the 'dead zone' of the mic, which in the case of a normal cardioid mic means the foldback speaker should be aimed directly at the back of it. 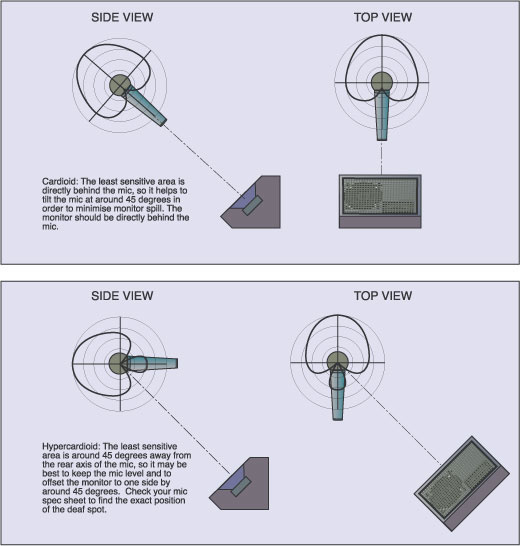 Note, however, that hypercardioid mics have their least sensitive zones around 30 degrees away from their rear-facing axis, and so the foldback speakers should be positioned accordingly. 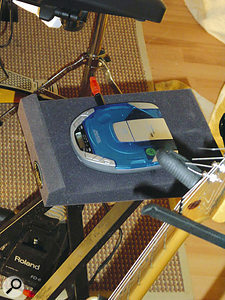 As an alternative to floor wedges, you may find that small active monitors on stands are more convenient in use — it doesn't matter if their bass response is limited, because low-frequencies from the PA subwoofer will be heard on stage even with the PA facing the audience.An alternative foldback approach I've used with some success, and one that is particularly applicable to systems that use subs, is to mount a couple of small, fairly high-powered speakers, such as JBL Control 1s, on mic stands and then feed these from a separate power amp or powered mixer. These speakers are small enough not to be obtrusive and, with the aid of a stand, you can position them fairly close while keeping them in the correct place relative to the mic. Furthermore, the fact that they have a limited low-end response is of no consequence, because you'll still be hearing all the bottom end from your sub. In fact even if your little monitors only go down to 100Hz or even 120Hz, they'll still work fine. Feedback builds up when the sound from the speakers gets back into the stage mics at such a level that the gain of the mic amps in the mixer causes the level to increase further each time the sound circulates around the system. Any system where the output is fed back to the input with a gain of greater than one at any frequency will rapidly turn into an oscillator! It is very important that you appreciate that feedback is a gain issue and not a volume issue. A loud singer is far less likely to have feedback problems than a quiet one, as the quite singer will require more gain to be heard. 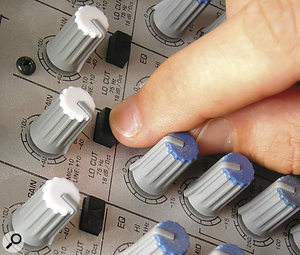 Your front-of-house desk's low-cut filters can be used to stop low-frequency feedback from becoming a problem.Obviously you need a fair amount of gain to help any typical singer to be heard over an amplified backline, so, to prevent your PA becoming a very loud oscillator, you need to minimise the amount of sound from the PA system getting back into the mics. 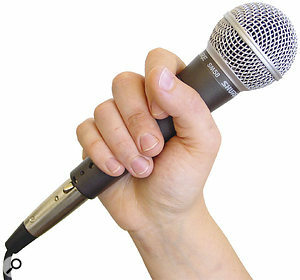 Using good-quality cardioid and hypercardioid mics helps, provided that you position your monitors appropriately, but the singer also needs to develop a good mic technique. In most cases this means working very close to the mic, because the closer you are, the louder the sound and therefore less gain needs to be used. Switch in the low-cut filter on the mixing console to help reduce low-frequency booming. 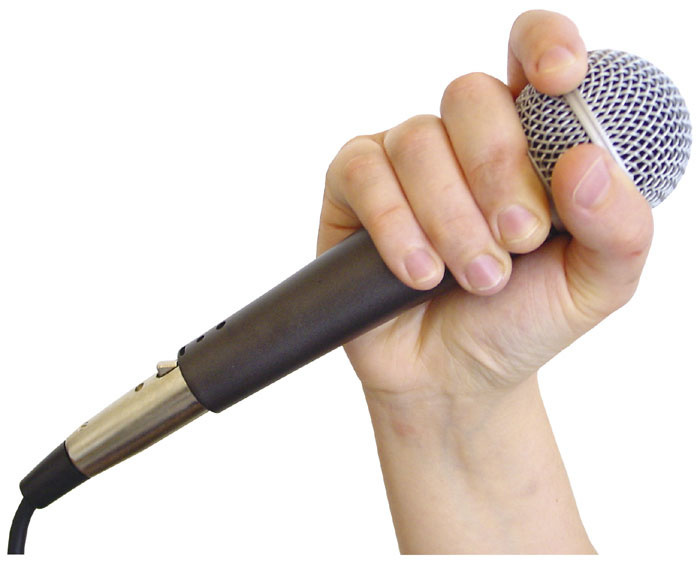 One thing that really winds me up is when I see singers cupping the mic in their hands or holding it very close to the business end! It is vitally important that their hand isn't touching the wire basket, otherwise the vents that create the cardioid pickup pattern get covered, the mic becomes more omnidirectional and everything starts feeding back. It beats me why nobody has designed a mic with razor wire around the top to prevent this once and for all! Holding a vocal mic too high up blocks the vents which give the capsule design its cardioid or hypercardioid response, and therefore actually increase the possibility of feedback.You can also run into difficulties if the singer moves around, because although you can optimise the mic position when it's on a fixed stand, you have no control at all once the singer carries it away! In addition to the feedback risks, the singer may move out of range of their own monitor or into the range of another monitor that's facing into the mic. The only solution is for the singer to be aware of potential danger areas, such as working in front of a loud backline or close to other stage monitors, and, as this is likely to be a member of your band (as this article is written for people taking their own music out of the studio), it's up to you to spell out the rules. You should also be very aware that the vocal mic doesn't just pick up the singer — it picks up everything it's pointing at, so nearby guitar amps, drum kit or monitors will also be picked up and amplified. Clearly you'll get the best results and retain the most control over the sound if the vocal mic points only at the vocalist and that nothing unduly loud is set up right behind him/her. If you have to have a loud guitar or keyboard amp behind the singer, then at least put it down on the floor so the majority of the sound passes below the vocal mic rather straight into it. In small venues, consider hanging a temporary curtain or sound blanket (those SOS duvets again?) behind the singer to absorb some of the sound. Holding the mic well clear of the basket will give better performance. Many small sound systems include a small graphic equaliser, which is often claimed to be able to help with feedback problems. This is based on the fact that feedback tends to build up at specific frequencies depending on the room acoustics and characteristics of the PA system as a whole, but in reality small graphic equalisers affect far too wide a section of the audio spectrum to be really useful in this respect. For example, a little five- or seven-band graphic will control sections of the audio spectrum around an octave wide, whereas the feedback frequency could probably be dealt with using a filter less than a semitone wide. Even a third-octave equaliser with 32 sliders is too coarse to be completely effective, though it is better than using a five-band equaliser. However, these little graphics can be useful to improve the overall sound by pulling down any frequency bands corresponding to those room resonances that cause boominess or boxiness. 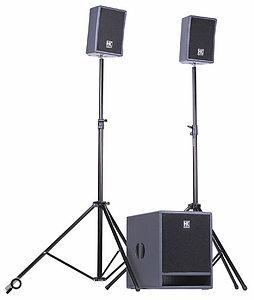 To be useful in combatting feedback, you'll need a graphic equaliser with third-octave bands or narrower — this means that there should be a minimum of 30 bands per channel, as on this Klark Teknik DN360.Every combination of venue and sound system has a different sonic signature with its own humps and dips, so each will need a different EQ setting. While it is impossible to get a completely flat response, it is worthwhile cutting any areas where there are obvious problems, though I wouldn't advise boosting weak areas, as the ear tends to overlook these anyway and boosting just aggravates feedback. If feedback is a real concern, consider buying a dedicated feedback suppressor, as this can give you a few vital extra decibels of headroom before feedback again becomes a problem. These handy gadgets use a bank of very narrow notch filters that can be varied in frequency, usually under control of the unit itself. The way these things normally work is that, during the soundcheck, you put the unit into setup mode, then increase the PA level until feedback starts to build up. The suppressor locks onto the feedback frequency and then deploys a filter to notch it out. If you increase the gain further, another frequency will start to ring, and again another filter will be sent out on a seek and destroy mission. You might do this until half a dozen or so filters are notching out the most problematic parts of the spectrum, though most devices have a few more filters that they keep in hand, so that if feedback occurs during the gig, perhaps because the singer has moved the mic, they can quickly step in and kill it. If sensible mic/monitor placement and a decent graphic EQ can't sort out your feedback problems, then a dedicated automatic feedback suppressor, such as the Sabine FBX2020 Plus shown here, may be the only solution.Whether using a feedback suppressor or not, I find the best way to do the initial setup is to get the system as loud as possible without it actually feeding back, then to drop the overall level by around 10dB to make sure nothing is ringing and to leave some safety margin. Hopefully things will improve further when the audience turns up, as they'll absorb some of the reflected energy in the room. Where monitors are being used, you may choose to use the feedback suppressor just in the monitor path (as this is where the worst feedback problems stem from) or use one in the monitor path and another in the main PA feed, usually connected via the mixer's master insert points. Fortunately, my own live music requires very little in the way of vocals, other than announcements, but even so we've come up against some interesting problems. We are a three-piece band (for want of a better description!) playing our own brand of ambient/chill-out music, and we have a small PA with no sub — as we're usually playing on the same bill as a DJ who does have a big sound system, we feed some of the mix to his system just to help reinforce the bass end. This can be done using pre-fade sends from our mixer, but we discovered early on that just patching in a cable often resulted in hum problems, so we now take the feed via a stereo DI box with the ground lift switch set to the Lift position. My next purchase will be a small active PA system with a sub, but in the meantime, this kludge gets us by. Note that simply feeding a sub from an aux send, as we occasionally do, isn't an entirely satisfactory solution, because the bass end is also being fed to the main speakers, making them work just as hard as ever. A properly designed system that uses a sub filters the low bass out of the main speaker feeds, which means they are able to reproduce higher levels of mid-range and high-frequency sound without exceeding their power handling capacity. The line-up comprises myself on guitar, which is DI'd into the PA via one output of a Line 6 Pod XT, while the other feeds a small guitar combo so that I can hear what I'm playing. This works well and creates the illusion of a perverse kind of stereo at smaller gigs, as any stereo delays alternate between the PA and the combo. We have experimented playing the fixed sequenced parts from a laptop computer, but because these have been known to crash (what, really?! ), we now burn CDs of any rhythms and drones that we don't need to fiddle with during performance, and feed these to the PA in stereo via an Alesis Air FX, which allows some neat flanging effects to be applied to the backing parts in real time. This is also a nice visual thing, and gives me something to do before the guitar part comes in! It's also a good idea to stand the CD player on a block of foam to prevent skipping, as that's a dead giveaway! If you're playing along to a CD backing track live, then the last thing you want is for the CD to skip during your performance. For this reason, it's worth placing it on a block of foam to shield it from vibration as much as possible.Our bass is provided not only by the CD drone parts, but also by an acoustic bass guitar fitted with a pickup, and at the moment this tends to go through its own amplifier, though when the full-range PA comes along we'll probably put the majority of it through the PA and use a smaller bass combo on stage mainly as a monitor. Virtual instruments and samples are played live using a MIDI keyboard and a Titanium Mac laptop, where the built-in audio outputs are fed straight into the PA. Interestingly, this arrangement works perfectly when the computer is running from its batteries, but when the mains adaptor is connected there's a nasty buzz that we can't get rid of. Our solution is entirely pragmatic — we leave the charger connected until the set starts, then run on batteries! We've also experimented with some quasi-surround setups, using pre-fade mixer sends to feed additional amps and speakers, but to make this work really well we need to produce our backing tracks in surround, and that means we can't use regular backing CDs any more. The tidy answer is to mix to DVD, then take a DVD player around with us, or produce surround mixes on a hardware multitrack machine and then connect the discrete outputs from that into the system. Using a small but well-chosen PA system, it is possible to at least approach the quality of your studio work in live performance. 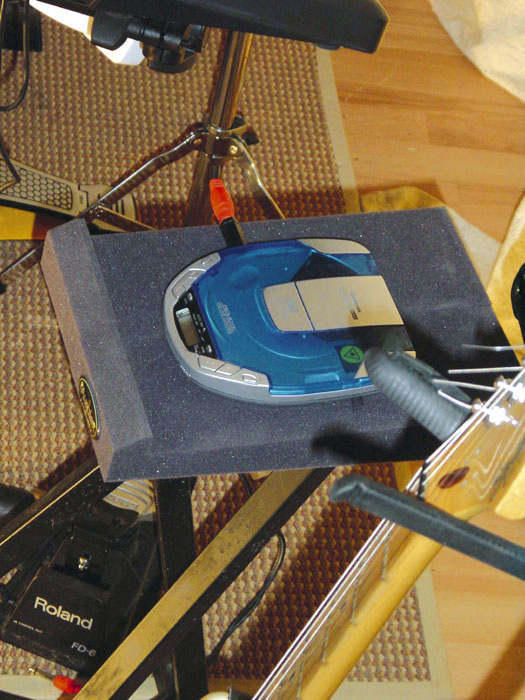 A 'satellite plus sub' system is the most compact and easy-to-use for those people who have space constraints, while the extra depth of bass really assists when you're playing rhythm-based music. When the performance includes vocals, as most do, you also need to be aware of issues relating to mic positioning and feedback, as described earlier in this article, but once the basic rules are appreciated, it isn't so difficult provided that you set the maximum vocal level first, then match the level of the backline to that. Choosing well-designed PA speakers, monitors and mics will greatly reduce your feedback problems in any given room, as well as giving you a better sound. Knowing the basics about optimising speaker setups is essential, as is deciding what to sequence, what to play live and what to record as a backing part, but with a little planning you can get great results without recourse to rocket science.